What is the Corridor Study? The Tennessee Department of Transportation (TDOT) has initiated a study to investigate a range of multimodal solutions along the interstate corridors of 55, 75, and 26. This 18-month study will emphasize congestion management, improving safety, maximizing the potential for freight diversion, and preserving/enhancing each corridor’s economic benefits. To learn more about the progress of the corridor studies across the state, visit TDOT's Long Range Planning website. 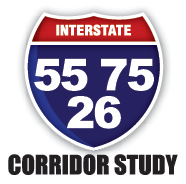 As a stakeholder in the study, you are invited to a public meeting to provide input on the transportation needs and areas of concern for the I-26 corridor. The public meeting will discuss the study’s progress using a presentation. A comment form will be provided for your convenience at the meeting. You may also provide feedback via an on-line survey by visitng SurveyMonkey.